Tonight's special guests will be Dr. Jaime Romo and Svava Brooks, members of our NAASCA family. Hailing from the San Diego area, Jaime and Svava are well known child abuse awareness advocates. Dr. Romo's most recent books are: “Healing the Sexually Abused Heart: A Workbook for Survivors, Thrivers, and Supporters;” “Parents Preventing Abuse;” and “Teachers Preventing Abuse.” He coaches survivors and supporters in person and via on-line healing programs at www.healingthesexuallyabusedheart.com. Ms Brooks is a co-founder and VP for a national non-profit in Iceland dedicated to awareness and education about child sexual abuse and prevention. She currently serves as a Program Director for TAALK. 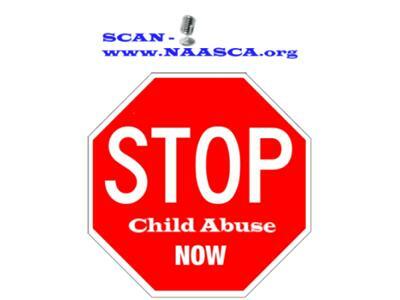 (www.taalk.org) where the mission is to break the silence that surrounds child sexual abuse. Svava also is a trainer and facilitator for Darkness to Light Stewards of Children prevention training (www.d2l.org). Jaime and Svava will talk about their ‘Safe Families, Safer Communities' workshop, now planned for May, where they'll share key concepts and practices to help parents prevent and detect child sexual abuse in any setting. The 2 hour interactive presentation is relevant to anyone affiliated with schools or other values driven organizations. Parents interested in advocacy and/or prevention strategies should attend.